I am always amazed at the abilities and instincts of newborn animals. New born guinea fowl keets very quickly have the ability to walk about with some speed. 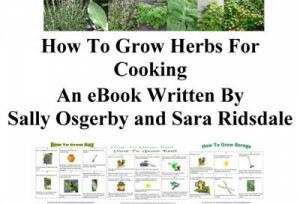 They also quickly find the water and food that is placed in the brooder and instinctively know what to do. 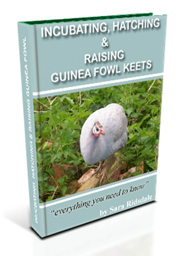 Here is a short video clip of 6 of my newly hatched guinea fowl keets. They are only a day old and can be seen scurrying around the brooder on their first day out of the incubator. Their independence from adult intervention and support is amazing to watch, although the newborn keets do like to huddle together and hide amongst the straw, especially when my camera enters the brooder!! 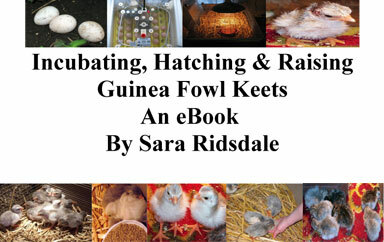 There are 6 guinea fowl keets, one white keet and five lavender keets. I have already decided that I am going to keep the white keet for breeding purposes and am trying to think of a name. If you can think of an appropriate name after watching the video then please let me know. Now enter the world of the brooder by clicking on the video clip! I hope you enjoyed your time in the brooder with the day old guinea fowl keets! Come back and visit them again soon.